I have known and have done business with Adrian Low and his organization, Audio Excellence Inc., since 1996. They have provided services including design, implementation and maintenance in all areas of audio/visual, home automation, security surveillance and home theater. I have found Adrian and his personnel to be honest, trustworthy, knowledgeable, responsive and passionate about their work. Over the past 14 years, Audio Excellence has installed 3 High End Audio and 2 Home Theater Systems for me. I am most pleased. I've been a customer of Audio Excellence for 20 years. Adrian and his staff have always treated me with the utmost respect. 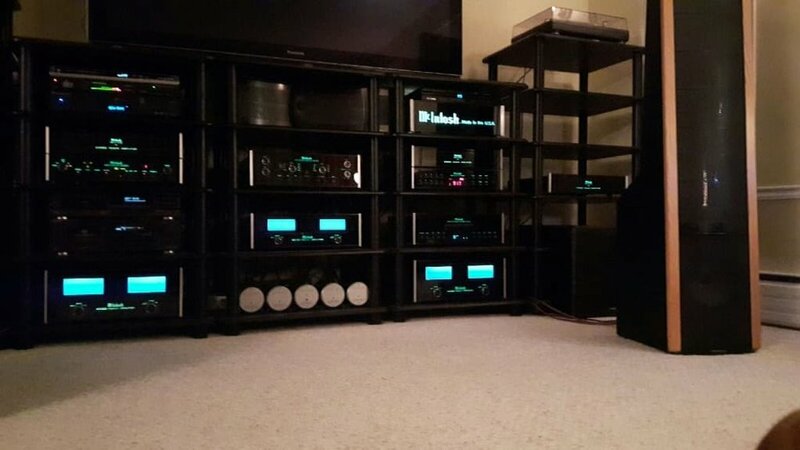 I am a big fan of McIntosh audio equipment. I had a specific system in mind. Adrian and his staff really went to bat to achieve my goal. So, I'd like to thank everyone at Audio Excellence for their professional assistance and service over the years. That's why I'm a loyal customer of the store. It was great pleasure dealing with Jay and Adrian helping me with my purchase at Audio Excellence. This was a long distance purchase and we had great communication via email. I really enjoyed Jay’s advice and insights in the DAC’s I was interested in. Listening to the DAC after its arrival, I am extremely pleased with the choice we arrived at. Great people to deal with, highly recommended and five stars! I bought a pair of Magnepan 0.7 speakers from Audio Excellence and they are awesome. Adrian, Vilip and Jay were fantastic to deal with. A very knowledgeable group of guys. They have a great selection of audio equipment. Thanks for all your help. I took the plunge and made a big system upgrade. I dealt with Adrian very pleasant to talk with, many years of experience in the Hi-Fi business and very professional. He has a great staff, Vilip and Jay were equally helpful and knowledgeable. They made my experience a very good one and definitely looking forward to a long relationship with Audio Excellence. I have been to Audio Excellence several times and have always had great visits. The staff is always willing to show you the audio equipment in the store, demo it with you, and take the time out to understand your needs before making recommendations. I like to research a lot before going to the store but there have been a couple times that I have gone in looking for something specific and coming out with something else that made me happier. Jay helped me pick out a great set of headphones that matched my budget and the music I listen to. He and Vilip also helped me choose a DAP that suited my needs. On another visit, Adrian toured me through the store and helped explained the different components available. He gave me ideas on how I could introduce different pieces into my home system. Recently, the guys introduced me to iPurifiers which ended up being a more economical solution to the power conditioner I was originally looking at. These guys are knowledgeable and passionate about all things audio! I highly recommend a visit to the store! Recently bought a pair of pre-owned Magneplanars from the Audio Excellence website. Xin was attentive to my questions, and they took great care to make sure they were shipped safely to me in Winnipeg. I'm very happy with my purchase and would certainly deal with them again. Adrian is patient, professional, and incredibly helpful throughout the entire demo and purchasing process. He is knowledgeable, and committed as far as my experience goes to excellence - in sales, installation, and service. He is also honest. What more could you want from a high-end stereo store!! Can find high-end audio products here and the sales guy very nice. Adrian is one of the most, no, the most professional individuals that you will find in the Consumer Electronics industry. His knowledge is unprecedented and his patience and easy demeanor make it a true pleasure to do business with Audio Excellence. When you add the quality brands that Adrian offers, the experience is nothing short of incredible. Welcome to the land of Oz and Adrian is the wizard! Adrian and his staff are knowledgeable and wonderful to deal with. No pressure sales and provided a wonderful time listening to very nice collection of speakers. If you are looking for advice and audiophile equipment visit Adrian and his staff for great customer service and advice. I would not hesitate to deal with Adrian again. Awesome place !!! If you're an audiophile you simply have to visit this place as they have some incredible stuff with speakers all the way up to $80,000 on display. Coolest store I've been to in a long time. It was a pleasure working with Adrian, absolutely brilliant 5* service from beginning to end! Adrian just delivered and set up a pair of Wilson Sabrina’s at my house which sound amazing! From the time I asked him to look at my space to finding solution for my old speakers the whole process and experience was above expectations. It’s great to deal with a passionate and dedicated individual who enjoys music and happens to sell some of the best equipment in the world! Highly recommend Audio Excellence a wonderful place to immerse yourself into hifi heaven. Excellence just like in the name. Thank you Adrian & Vilip for getting the amp back to commission within a few days. Now I can happily enjoy my Santana, Coltrane/Hartman etc. Thank you! I've known Adrian since the Warden/Ellesmere days and I can always count on him for his expert advise and integrity. I'm just glad you moved back to Markham.